Unwanted hair can be a frustrating problem. It is one that many of our clients complain about. 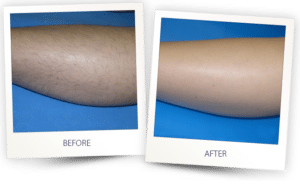 We are proud to offer laser hair removal services at our Phoenix location to achieve lasting results that enhance confidence and reduce the inconvenience of shaving, plucking, and removing hair on a routine basis. The primary benefit of laser hair removal is that this process disables hair follicles. The long-term disruption of hair production eliminates the need for grooming with razors, tweezers, wax, and other modalities. So you not only get smoother skin but you also gain freedom from the burden of consistently removing unwanted hair. When hair is removed through vaporization with laser energy, the need for other methods of hair removal is immediately eliminated. What else gets eliminated are the frustrating side effects of shaving, waxing, and plucking, such as redness, ingrown hairs, razor burn, stubble, and shadowing. The premise of laser hair removal is to stop hair growth entirely. When specific wavelengths of light penetrate into the hair follicles, they get absorbed into strands of hair. The melanin, or color, in strands of hair is what makes this possible. When light permeates the follicle, hair vaporizes immediately. At the same time, the heat that destroys existing hairs is absorbed into the walls of the follicles. This absorption damages the follicles in a controlled manner and disables the ability to continue producing hair beyond the current growth cycle. This is why multiple treatments are necessary; because only the hair that is in the follicles at the time of treatment is removed. Some areas of the body are more sensitive than others during laser hair removal. Regardless, patients rarely describe the process as painful. The stinging and snapping that may be felt during treatment are generally more of a mild nuisance than a painful side effect. It may be possible to enhance comfort by applying a topical numbing cream to the skin for a few minutes before treatment begins. Talk with your provider about your concerns regarding discomfort. We will make every effort to keep you comfortable. Remember, too, that each laser hair removal treatment lasts only a few minutes. Laser hair removal is performed while the provider and the patient wear protective eye gear. During treatment, the handheld applicator is passed over the skin while the laser device emits specific wavelengths of energy. As the laser light penetrates hair follicles, a minor snapping or stinging sensation may be felt. This indicates that thermal energy is being absorbed into the pigment of each hair in the hair follicles. Immediately, hairs are vaporized and thermal energy transfers to the walls of the hair follicle, causing controlled damage that alters the follicle’s ability to continue producing. The duration of laser hair removal depends on the treatment area or the number of areas being treated. Underarm and arm treatments may take only 5 to 10 minutes, whereas treating the legs may require thirty minutes or more. Your provider will discuss the details of your treatment process after a thorough consultation in our office. How many treatments are needed to remove the hair? It is important to plan for multiple treatment sessions when beginning your laser hair removal journey. Up to 8 treatments, sometimes more, are needed to effectively halt the hair growth cycle. Additional factors, such as age, hormones, and complexion contribute to the number of treatments you may need. The primary risk of laser hair removal is skin irritation, blistering, and burns. When performed by a trained, licensed professional, laser hair removal is a safe and effective method of eliminating unwanted hair. What precautions should I take before and after treatment? There are very few precautions that need to be taken before beginning your series of laser hair removal treatments. During your consultation, please inform your provider of any medications you are taking, including over-the-counter medicines and dietary supplements. Some may need to be stopped a few days before treatment. It is advisable that you shave a day or two before laser hair removal. Avoid any other form of grooming, such as waxing or plucking. Avoid sun exposure as much as possible. Use sunscreen and do not actively tan, even in a tanning bed, for the duration of your treatment process.